Ethiopia is “off-grid”, right? | The Life and Times of a "Renaissance Ronin"
Here at “Sustainability Central”, we “push purpose and technology” to document tools for sustainable families globally. Our readers know that we spend a lot of time talking about sustainable, affordable, energy efficient homes that can be built BY FAMILIES, FOR FAMILIES. But it doesn’t stop there. Once you’re home is sustainable, you have the ability to embrace sustainable practices that will make you that much more self-responsible and self-reliant. It’s about using your surroundings and environment to a positive benefit, by embracing technology and sustainability. If the Maker gives you sunshine to make electricity with… with, why NOT use it to power your home or outbuildings? But, it’s not just about making power. It’s about living life, 24/7. And that means… you gotta eat. Right? We’ve talked about solar ovens before. I mean, if you have sunlight and flour… why not make bread, or even (gasp!) PIZZA? In Ethiopia, they want to bake bread using sunshine, too. But they’re stepping it up to the next level. You won’t need the sun, 24/7 in order to cook your meals if Asfafaw Tesfay has his way. 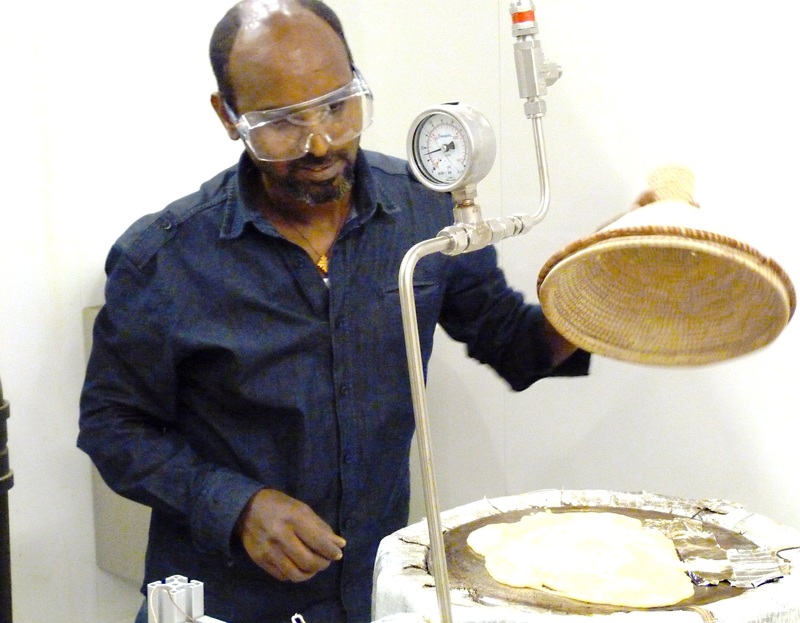 Ethiopians may in the future be able to bake their own bread, the «injeras», with help from the sun. Large parts of Ethiopia are today without access to electric power or firewood. The results of deforestation are severe. But what if people got the opportunity to make dinner without using coal, wood, oil or gas? This can become a reality if students at Norwegian University of Science and Technology (NTNU) in Trondheim, Norway succeed in commercializing an oven powered by the sun itself. The oven has been developed at NTNU keeping the needs of people in Ethiopia in mind. 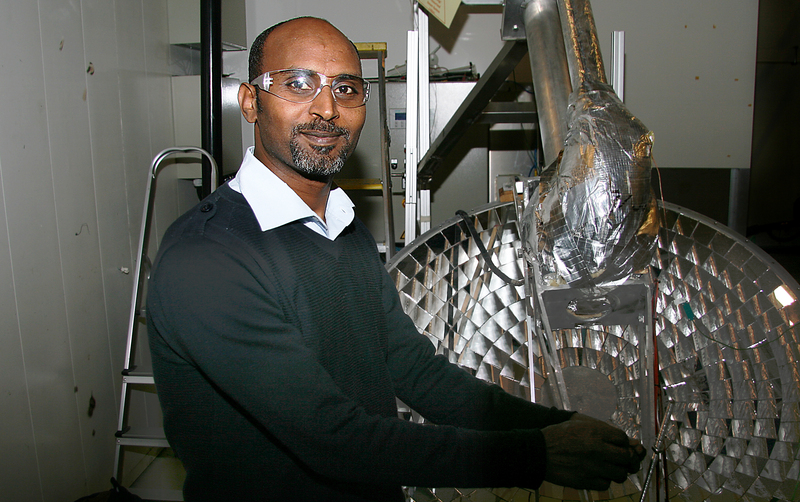 Asfafaw Tesfay came from Ethiopia to Norway in 2008 to develop a system based on solar power for his home country. He is now very near his goal, which is constructing a solar powered oven which can bake at a temperature of 220⁰C (428⁰F) for 24 hours. – This oven has several advantages compared to other solar powered ovens on the market. The biggest difference is that it can reach a high temperature and store that high temperature over time, which makes it perfect for baking “injeras”, which most people in Ethiopia eat three times a day, explains student Even Sønnik Haug Larsen. He is now trying to commercialize the product together with his fellow students Mari Hæreid, Sebastian Vendrig and Dag Håkon Haneberg from NTNU School of Entrepreneurship. For years scientists across the globe have tried to develop solar powered ovens with different qualities aimed at developing countries. The problem has been that these solutions have not been optimized with the needs of the users, for instance in Ethiopia, in mind. The ovens have not reached high enough temperatures to make injeras, and can’t store the heat so that it is possible to make food also in the evenings or at night. – On these ovens you have only been able to boil rice or vegetables and such. But that is not what most Ethiopians eat. They eat injeras, a sort of flatbread which needs to be baked. For that you need a temperature of 200-250⁰C (392-482⁰F), Haug Larsen says. He adds that he finds it rewarding in itself to make it possible for people in developing countries to make food in an efficient, safe and environmentally safe way any time of day. – It is exciting to use our technology in practice and show that the product is useful to many people, Haug Larsen, who is also a teacher, says. The solar powered oven is environmentally friendly. When exposed to sunlight the heat is transferred to a container with salt chemicals. There are two working prototypes, one at NTNU and the other in Ethiopia. The need for such an oven is huge, the students claim. 85 percent of the people in the country don’t have access to electric power. Due to the fact that they have used fire wood instead, there is only three percent forested areas left in the country, down from 35 percent in 2000. – People hardly have any fire wood or electric power, but they don’t have a lack of sun, Haug Larsen says. Together with fellow student Sebastian Vendrig he traveled to Ethiopia around mid-January to get in touch with customers and potential partners. At the same time they wanted to see if it was possible to produce the oven locally in Mekele, the home city of Asfafaw, the man behind the idea. – As users and potential customers are in Ethiopia it is important for us to travel there to meet them and at the same time experience the culture and society. We also want to establish a viable business there and will at the same time look at possible production workshops, said Haug Larsen before they left. The students have already been in touch with the Norwegian embassy in Addis Abeba, The Norwegian Agency for Development Cooperation (Norad) and several organizations willing to help the students. The project received means from Norfund, Spark NTNU and Trønder Energi. The students are also cooperating with NTNU Technology Transfer (TTO). The connection between Asfafaw and Ethiopia is the main reason why they are trying to establish the product here first. The students see a potential in organizations working in the country, and in schools, universities, hospitals, bakeries, restaurants and hotels. – Later it might be possible to make the oven accessible also for private people, but as it is now they have limited funds and will not know how to use it, says Haug Larsen. Together with the rest of the student group he hopes to start a business and work with the oven also after his studies. – It would be fantastic if our product could improve the conditions in several developing countries and if we can be part of creating jobs locally, Haug Larsen says. Seriously, if a campaign on Indiegogo hits the social media main stream it would be a very good thing for the oven. Personally, I see a version for the masses as more useful and helpful. But if the tech is too complicated (i.e: expensive) then just getting the stove out there is a grand thing.